Our Full-Time Volunteering programme won the Youth Volunteering and Social Action Award at the (CYPN) Children and Young People Now award ceremony in central London last night. 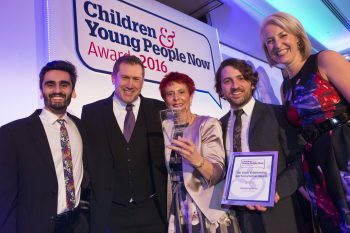 The CYPN awards have become the gold standard for professionals working with children, young people and families. Set up 11 years ago, the judges seek to shine a light on projects that can demonstrate commitment, innovation and creativity in addressing some of society’s toughest problems, and changing the lives of vulnerable individuals, families and communities. Find out more on our work with and for young people.